and i love your gigantic sunglasses! Those are so trendy! Great stash-busting! Your new set looks great! I love all the little flecks of color. These are beautiful! The color & chunkiness (is that a word?) is perfect. I wish it was cold here. I miss scarves already. Great idea and it looks great on you! I love the shape if the hat and the ridges. Definitely you should make wrist warmers to match! Raddd. I love those hats. I love the hat! It's extremely cute. 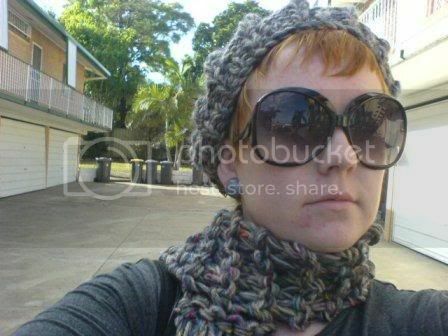 How did you do that ribbing, is it reverse stockinette with a knit thrown in or is it fancy? I really like how it pops.